RhodeSoft was started by husband and wife team Toni and Jacob Rhodes. Their son Graham and dog Einstein contribute to the venture on a regular basis. Toni has a master's degree in education and was a kindergarten teacher for many years. She is currently an educational writer. Jacob is a research engineer at the Georgia Institute of Technology and has a master's degree in film and video. 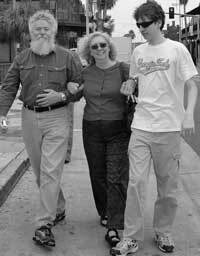 In this photo Jacob, Toni, and Graham are walking along a street in Ybor City, Tampa. Photo taken by Andrea Kautz.